Acute: Low blood pressure, blockage of the urinary tract, certain medications, muscle breakdown, and hemolytic uremic syndrome. Kidney failure, also known as end-stage kidney disease, is a medical condition in which the kidneys no longer function. It is divided into acute kidney failure (cases that develop rapidly) and chronic kidney failure (those that are long term). Symptoms may include leg swelling, feeling tired, vomiting, loss of appetite, or confusion. Complications of acute disease may include uremia, high blood potassium, or volume overload. Complications of chronic disease may include heart disease, high blood pressure, or anemia. Causes of acute kidney failure include low blood pressure, blockage of the urinary tract, certain medications, muscle breakdown, and hemolytic uremic syndrome. Causes of chronic kidney failure include diabetes, high blood pressure, nephrotic syndrome, and polycystic kidney disease. Diagnosis of acute disease is often based on a combination of factors such as decrease urine production or increased serum creatinine. Diagnosis of chronic disease is typically based on a glomerular filtration rate (GFR) of less than 15 or the need for renal replacement therapy. It is also equivalent to stage 5 chronic kidney disease. Treatment of acute disease typically depends on the underlying cause. Treatment of chronic disease may include hemodialysis, peritoneal dialysis, or a kidney transplant. 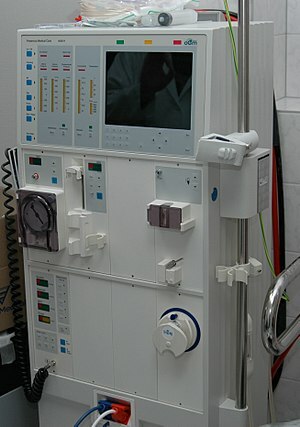 Hemodialysis uses a machine to filter the blood outside the body. In peritoneal dialysis specific fluid is placed into the abdominal cavity and then drained, with this process being repeated multiple times per day. Kidney transplantation involves surgically placing a kidney from someone else and then taking immunosuppressant medication to prevent rejection. Other recommended measures from chronic disease include staying active and specific dietary changes. In the United States acute disease affects about 3 per 1,000 people a year. Chronic disease affects about 1 in 1,000 people with 3 per 10,000 people newly develop the condition each year. Acute disease is often reversible while chronic disease often is not. With appropriate treatment many with chronic disease can continue working. Kidney failure can be divided into two categories: acute kidney injury or chronic kidney disease. The type of renal failure is differentiated by the trend in the serum creatinine; other factors that may help differentiate acute kidney injury from chronic kidney disease include anemia and the kidney size on sonography as chronic kidney disease generally leads to anemia and small kidney size. Acute kidney injury (AKI), previously called acute renal failure (ARF), is a rapidly progressive loss of renal function, generally characterized by oliguria (decreased urine production, quantified as less than 400 mL per day in adults, less than 0.5 mL/kg/h in children or less than 1 mL/kg/h in infants); and fluid and electrolyte imbalance. AKI can result from a variety of causes, generally classified as prerenal, intrinsic, and postrenal. Many people diagnosed with paraquat intoxication experience AKI, sometimes requiring hemodialysis. The underlying cause must be identified and treated to arrest the progress, and dialysis may be necessary to bridge the time gap required for treating these fundamental causes. Graphic representation of a CKD affected kidney. Chronic kidney disease (CKD) can also develop slowly and, initially, show few symptoms. CKD can be the long term consequence of irreversible acute disease or part of a disease progression. Acute kidney injuries can be present on top of chronic kidney disease, a condition called acute-on-chronic kidney failure (AoCRF). The acute part of AoCRF may be reversible, and the goal of treatment, as with AKI, is to return the person to baseline kidney function, typically measured by serum creatinine. Like AKI, AoCRF can be difficult to distinguish from chronic kidney disease if the person has not been monitored by a physician and no baseline (i.e., past) blood work is available for comparison. Symptoms can vary from person to person. Someone in early stage kidney disease may not feel sick or notice symptoms as they occur. When the kidneys fail to filter properly, waste accumulates in the blood and the body, a condition called azotemia. Very low levels of azotaemia may produce few, if any, symptoms. If the disease progresses, symptoms become noticeable (if the failure is of sufficient degree to cause symptoms). Kidney failure accompanied by noticeable symptoms is termed uraemia. Acute kidney injury (previously known as acute renal failure) – or AKI – usually occurs when the blood supply to the kidneys is suddenly interrupted or when the kidneys become overloaded with toxins. Causes of acute kidney injury include accidents, injuries, or complications from surgeries in which the kidneys are deprived of normal blood flow for extended periods of time. Heart-bypass surgery is an example of one such procedure. Drug overdoses, accidental or from chemical overloads of drugs such as antibiotics or chemotherapy, may also cause the onset of acute kidney injury. Unlike chronic kidney disease, however, the kidneys can often recover from acute kidney injury, allowing the person with AKI to resume a normal life. People suffering from acute kidney injury require supportive treatment until their kidneys recover function, and they often remain at increased risk of developing future kidney failure. Among the accidental causes of renal failure is the crush syndrome, when large amounts of toxins are suddenly released in the blood circulation after a long compressed limb is suddenly relieved from the pressure obstructing the blood flow through its tissues, causing ischemia. The resulting overload can lead to the clogging and the destruction of the kidneys. It is a reperfusion injury that appears after the release of the crushing pressure. The mechanism is believed to be the release into the bloodstream of muscle breakdown products – notably myoglobin, potassium, and phosphorus – that are the products of rhabdomyolysis (the breakdown of skeletal muscle damaged by ischemic conditions). The specific action on the kidneys is not fully understood, but may be due in part to nephrotoxic metabolites of myoglobin. Chronic kidney disease (CKD) has numerous causes. The most common causes of CKD are diabetes mellitus and long-term, uncontrolled hypertension. Polycystic kidney disease is another well-known cause of CKD. The majority of people afflicted with polycystic kidney disease have a family history of the disease. Other genetic illnesses affect kidney function, as well. Overuse of common drugs such as ibuprofen, and acetaminophen (paracetamol) can also cause chronic kidney disease. Some infectious disease agents, such as hantavirus, can attack the kidneys, causing kidney failure. The APOL1 gene has been proposed as a major genetic risk locus for a spectrum of nondiabetic renal failure in individuals of African origin, these include HIV-associated nephropathy (HIVAN), primary nonmonogenic forms of focal segmental glomerulosclerosis, and hypertension affiliated chronic kidney disease not attributed to other etiologies. Two western African variants in APOL1 have been shown to be associated with end stage kidney disease in African Americans and Hispanic Americans. Chronic kidney failure is measured in five stages, which are calculated using the person’s GFR, or glomerular filtration rate. Stage 1 CKD is mildly diminished renal function, with few overt symptoms. Stages 2 and 3 need increasing levels of supportive care from their medical providers to slow and treat their renal dysfunction. People with stage 4 and 5 kidney failure usually require preparation towards active treatment in order to survive. Stage 5 CKD is considered a severe illness and requires some form of renal replacement therapy (dialysis) or kidney transplant whenever feasible. Before the advancement of modern medicine, renal failure was often referred to as uremic poisoning. Uremia was the term for the contamination of the blood with urea. It is the presence of an excessive amount of urea in blood. Starting around 1847, this included reduced urine output, which was thought to be caused by the urine mixing with the blood instead of being voided through the urethra. The term uremia is now used for the illness accompanying kidney failure. In non-diabetics and people with type 1 diabetes, a low protein diet is found to have a preventative effect on progression of chronic kidney disease. However, this effect does not apply to people with type 2 diabetes. A whole food, plant-based diet may help some people with kidney disease. A high protein diet from either animal or plant sources appears to have negative effects on kidney function at least in the short term. People who received earlier referrals to a nephrology specialist, meaning a longer time before they had to start dialysis, had a shorter initial hospitalization and reduced risk of death after the start of dialysis. The authors highlighted the resulting importance of early referral in slowing progression of chronic kidney disease. Other methods of reducing disease progression include minimizing exposure to nephrotoxins such as NSAIDs and intravenous contrast. ^ a b c d e f g h i j "Kidney Failure". National Institute of Diabetes and Digestive and Kidney Diseases. Retrieved 11 November 2017. ^ a b c d Blakeley, Sara (2010). Renal Failure and Replacement Therapies. Springer Science & Business Media. p. 19. ISBN 9781846289378. ^ a b Liao, Min-Tser; Sung, Chih-Chien; Hung, Kuo-Chin; Wu, Chia-Chao; Lo, Lan; Lu, Kuo-Cheng (2012). "Insulin Resistance in Patients with Chronic Kidney Disease". Journal of Biomedicine and Biotechnology. 2012: 1–5. doi:10.1155/2012/691369. PMC 3420350. PMID 22919275. ^ a b c d e f g "What is renal failure?". Johns Hopkins Medicine. Retrieved 18 December 2017. ^ a b c d e Cheung, Alfred K. (2005). Primer on Kidney Diseases. Elsevier Health Sciences. p. 457. ISBN 1416023127. ^ a b Clatworthy, Menna (2010). Nephrology: Clinical Cases Uncovered. John Wiley & Sons. p. 28. ISBN 9781405189903. ^ a b Ferri, Fred F. (2017). Ferri's Clinical Advisor 2018 E-Book: 5 Books in 1. Elsevier Health Sciences. p. 37. ISBN 9780323529570. ^ Ferri, Fred F. (2017). Ferri's Clinical Advisor 2018 E-Book: 5 Books in 1. Elsevier Health Sciences. p. 294. ISBN 9780323529570. ^ Moore, EM; Bellomo, R; Nichol, AD (2012). "The meaning of acute kidney injury and its relevance to intensive care and anaesthesia". Anaesthesia and intensive care. 40 (6): 929–48. PMID 23194202. ^ Ricci, Zaccaria; Ronco, Claudio (2012). "New insights in acute kidney failure in the critically ill". Swiss Medical Weekly. 142: w13662. doi:10.4414/smw.2012.13662. PMID 22923149. ^ A.D.A.M. Medical Encyclopedia (2012). "Acute kidney failure". U.S. National Library of Medicine. Retrieved 1 January 2013. ^ Klahr, Saulo; Miller, Steven B. (1998). "Acute Oliguria". New England Journal of Medicine. 338 (10): 671–75. doi:10.1056/NEJM199803053381007. PMID 9486997. ^ Medline Plus (2011). "Chronic kidney disease". A.D.A.M. Medical Encyclopedia. National Institutes of Health. Retrieved 1 January 2013. ^ a b Dr Per Grinsted (2005-03-02). "Kidney failure (renal failure with uremia, or azotaemia)". Retrieved 2009-05-26. ^ Dr Andy Stein (2007-07-01). Understanding Treatment Options For Renal Therapy. Deerfield, Illinois: Baxter International Inc. p. 6. ISBN 1-85959-070-5. ^ The PD Companion. Deerfield, Illinois: Baxter International Inc. 2008-05-01. pp. 14–15. 08/1046R. ^ Amgen Inc. (2009). "10 Symptoms of Kidney Disease". Retrieved 2009-05-26. ^ MedicineNet, Inc. (2008-07-03). "Hyperkalemia". Retrieved 2009-05-26. ^ Katzung, Bertram G. (2007). Basic and Clinical Pharmacology (10th ed.). New York, NY: McGraw Hill Medical. p. 733. ISBN 978-0-07-145153-6. ^ National Kidney and Urologic Diseases Information Clearinghouse (2012). "The Kidneys and How They Work". National Institute of Diabetes and Digestive and Kidney Diseases. Retrieved 1 January 2013. ^ Kes, Petar; Basić-Jukić, Nikolina; Ljutić, Dragan; Brunetta-Gavranić, Bruna (2011). "Uloga arterijske hipertenzije u nastanku kroničnog zatajenja bubrega" [The role of arterial hypertension in the development of chronic renal failure] (PDF). Acta Medica Croatica (in Croatian). 65 (Suppl 3): 78–84. PMID 23120821. Archived from the original (PDF) on 2013-07-19. ^ Perneger, Thomas V.; Whelton, Paul K.; Klag, Michael J. (1994). "Risk of Kidney Failure Associated with the Use of Acetaminophen, Aspirin, and Nonsteroidal Antiinflammatory Drugs". New England Journal of Medicine. 331 (25): 1675–79. doi:10.1056/NEJM199412223312502. PMID 7969358. ^ Appel, Gerald B; Mustonen, Jukka (2012). "Renal involvement with hantavirus infection (hemorrhagic fever with renal syndrome)". UpToDate. Retrieved 1 January 2013. ^ Bostrom, M. A.; Freedman, B. I. (2010). "The Spectrum of MYH9-Associated Nephropathy". Clinical Journal of the American Society of Nephrology. 5 (6): 1107–13. doi:10.2215/CJN.08721209. PMC 4890964. PMID 20299374. ^ Genovese, Giulio; Friedman, David J.; Ross, Michael D.; Lecordier, Laurence; Uzureau, Pierrick; Freedman, Barry I.; Bowden, Donald W.; Langefeld, Carl D.; et al. (2010). "Association of Trypanolytic ApoL1 Variants with Kidney Disease in African Americans". Science. 329 (5993): 841–45. doi:10.1126/science.1193032. PMC 2980843. PMID 20647424. ^ Tzur, Shay; Rosset, Saharon; Shemer, Revital; Yudkovsky, Guennady; Selig, Sara; Tarekegn, Ayele; Bekele, Endashaw; Bradman, Neil; et al. (2010). "Missense mutations in the APOL1 gene are highly associated with end stage kidney disease risk previously attributed to the MYH9 gene". Human Genetics. 128 (3): 345–50. doi:10.1007/s00439-010-0861-0. PMC 2921485. PMID 20635188. ^ "GFR calculator". Kidney.org. Retrieved 2011-09-25. ^ Meyer, Timothy W.; Hostetter, Thomas H. (2007). "Uremia". New England Journal of Medicine. 357 (13): 1316–25. doi:10.1056/NEJMra071313. PMID 17898101. ^ Rughooputh, Mahesh Shumsher; Zeng, Rui; Yao, Ying (2015). "Protein Diet Restriction Slows Chronic Kidney Disease Progression in Non-Diabetic and in Type 1 Diabetic Patients, but Not in Type 2 Diabetic people: A Meta-Analysis of Randomized Controlled Trials Using Glomerular Filtration Rate as a Surrogate". PLoS One. 10 (12): e0145505. doi:10.1371/journal.pone.0145505. ISSN 1932-6203. PMC 4692386. PMID 26710078. ^ Chauveau, Philippe; Combe, Christian; Fouque, Denis; Aparicio, Michel (2013-11-01). "Vegetarianism: advantages and drawbacks in patients with chronic kidney diseases". Journal of Renal Nutrition. 23 (6): 399–405. doi:10.1053/j.jrn.2013.08.004. ISSN 1532-8503. PMID 24070587. ^ Bernstein, AM; Treyzon, L; Li, Z (April 2007). "Are high-protein, vegetable-based diets safe for kidney function? A review of the literature". Journal of the American Dietetic Association. 107 (4): 644–50. doi:10.1016/j.jada.2007.01.002. PMID 17383270. ^ a b Smart, Neil A.; Dieberg, Gudrun; Ladhani, Maleeka; Titus, Thomas (2014-06-18). "Early referral to specialist nephrology services for preventing the progression to ESRD". The Cochrane Database of Systematic Reviews (6): CD007333. doi:10.1002/14651858.CD007333.pub2. ISSN 1469-493X. PMID 24938824. ^ Dirkx, Tonja C.; Woodell, Tyler; Watnick, Suzanne (2017). Papadakis, Maxine A.; McPhee, Stephen J.; Rabow, Michael W. (eds.). Current Medical Diagnosis & Treatment 2018. New York, NY: McGraw-Hill Education. This page was last edited on 26 February 2019, at 16:45 (UTC).